In the past few months, we heard several rumors that the Finns are planning on entering the tablet market. At Nokia World 2013 in Abu Dhabi, Nokia unveiled its first tablet known as Nokia Lumia 2520 running Windows RT 8.1 and a 10.1-inch full HD display. The tablet will take on Microsoft Surface 2 one-on-one and comes with 4G LTE connectivity, which is not yet available on the Surface 2 tablet. 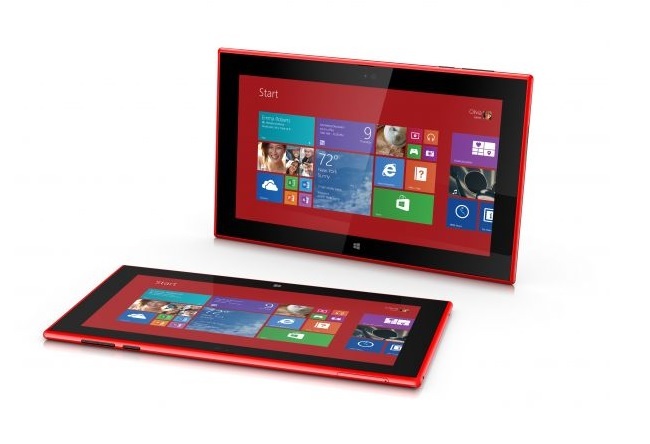 Nokia Lumia 2520 weighs only 615g and comes with a 10.1-inch full HD, IPS Capacitive Multi-Touch display boasting a resolution of 1920 x 1080 pixels. To power the tablet is the monstrous Snapdragon 800 chipset clocked at 2.2GHz with Adreno 330 GPU and 2GB RAM. The slate comes with a 32GB internal storage that is expandable using a microSD card slot of up to 32GB. On the rear, it comes with a 6.7MP camera with Carl Zeiss optics and a f1.9 aperture for better low-light photography. It will use the same Nokia Camera app that was introduced with Lumia 1520 andLumia 1320. Nokia Lumia 2520 brings a 2MP front-facing wide angle camera, plus a massive 8,000 mAh battery that aims to offer a battery life of up to 10 hours on constant video playback. In addition, the battery offers ultra-fast charging capable of going from zero to 80 percent in just one hour. On the connectivity side, the slate comes with NFC, A-GPS+GLONASS, WLAN 802.11 a/b/g/n, microUSB 3.0, BT 4.0 LE and a 3.5mm audio connector. On the software side, the tablet comes with Microsoft Office and Outlook pre-installed with no extra cost. Other software includes Story Teller, Video Director and a new version of Nokia HERE maps. 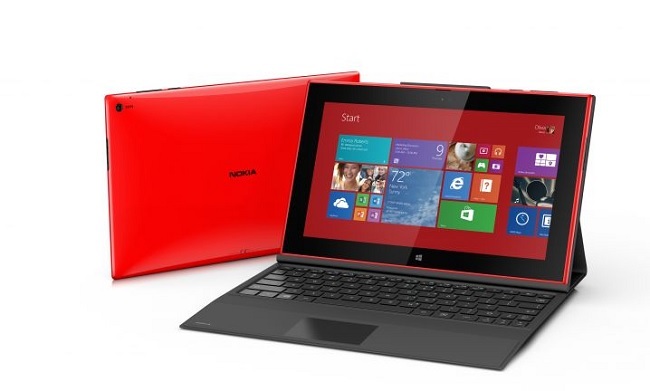 Alongside Nokia Lumia 2520, it comes with a Nokia Power Keyboard, an accessory that can offer a physical keyboard and can wrap around the tablet as a protection cover. Additionally, the power keyboard also comes with a battery capable of giving a battery time of up to five hours and two USB ports for connectivity and external storage options. The Nokia Power Keyboard is available separately for $149. The tablet runs Windows RT 8.1 as the operating system and will be available for sale by the end of this year with a $499 price tag. The tablet will come in red and white in a glossy finish as well as cyan and black in a matte finish. Initially, the slate will be rolled out in the US, UK and Finland, followed by other countries.